Video: Can 120 Volts Hurt You? Can 120 volts hurt you? You better believe it! 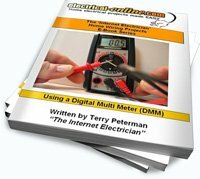 In this powerful video demonstration, the Internet Electrician shows the effects of 120 volts on a hot dog weiner, and draws a parallel between the damage done to it and the potential harm to a DIYer not following home electrical safety practices. The lesson here? Always, always, always, check to make sure the power is off to a circuit BEFORE you attempt any home electrical wiring project! Use a voltage tester or radio to confirm the power is off. This video is a short, but informative video clip from a national television show that I appeared in several years ago. I served as the electrical expert, answered live calls from people across the country, and provided educational tips and home electrical wiring advice targeted towards the DIY audience. This entry was posted in Safety, Videos, Wiring-Videos and tagged 120 volts, circuit, home electrical safety, safety, voltage testers, volts. Bookmark the permalink.